GEA Westfalia Separator Group was awarded IMO Type Approval by the Federal Maritime and Hydrographic Agency (BSH) for the BallastMaster ultraV 500. The document was handed over by representatives of the BSH in an official capacity to the project managers of the ballast water system at SMM 2014 in Hamburg. The 500m³ installation is a scale-up of the 250m³ variant which had already been certified with the IMO Type Approval in December 2011. 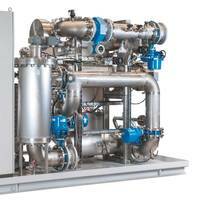 The GEA system uses mechanical filtration and ultraviolet radiation to treat ballast water. 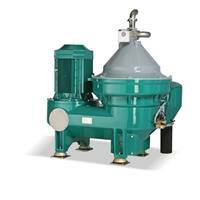 A solution for separating dangerous catalyst fines (cat fines) from fuel with one touch of the button: This is the new product GEA Westfalia Separator Group will be showcasing this year at the SMM 2014 in Hamburg. The company is continuing its clear line as a competent and innovative partner for the maritime industry. Stricter regulations and rules mean that ship operators constantly have to face new challenges. They also have to cope with the pressure of having to reduce operating costs and being efficient at the same time. According to the manufacturer, the newly launched control generation GEA Westfalia Separator IO reduces complexity and focuses on userfriendliness. 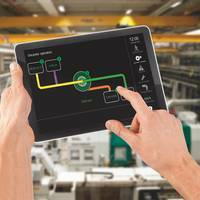 Accordingly, the initial consideration when developing the human machine interface was not what the implemented logical controller or the centrifuge are able to do; instead, the focus was on what the user needs, either the operator, the commissioner or the company’s own service engineer. Who needs what information and functionalities in which situation and what is not required, or in short: user-friendliness. 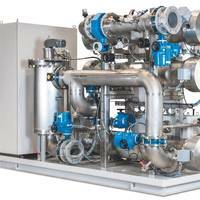 The BallastMaster ultraV developed by GEA Westfalia Separator Group for treating ballast water has been awarded the "Alternate Management System" (AMS) certificate. The approval was awarded by the United States Coast Guard (USCG) on November 11, 2013 and is considered to be the standard for the international recognition and selection of suppliers of ballast water processing installations. The AMS certificate is considered by the USCG to be a transitional measure until the type approval process has been formally implemented in American legislation. The Korean company Daewoo Shipbuilding & Marine Engineering (DSME) has placed an order for a total of 160 separators of the new eagleclass generation with GEA Westfalia Separator Group. They will operate on the twenty unequalled Triple-E container ships of A.P. Moeller Maersk shipping line, which will be launched between the end of 2013 and 2015. The Triple-E class is a new development of superlative in many respects. Every ship will be 400 metres in length, 59 metres in width and 73 meters in height, and can load 18,000 twenty-foot containers. The draft will be around 14.5 metres. A new solution of GEA Westfalia Separator Group for the treatment of ballast water with the aid of ultraviolet radiation, the BallastMaster ultraV, was certified in accordance with IMO guidelines and regulations. 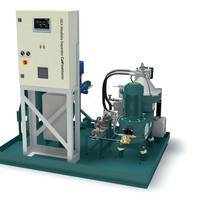 The BallastMaster ultraV ballast water management system is a mechanical/physical system solution for treating ballast water, including that with a high concentration of organisms and sedimentary particles. 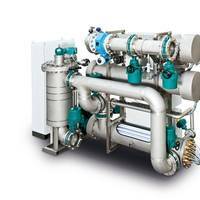 The two-stage system works with mechanical pre-filtration and subsequent disinfecting of the ballast water by UV-C and ultrasonic radiation without the use or generation of chemicals. In the first stage, an upstream mechanical filtration system removes all organisms and sedimentary particles larger than 20 microns.